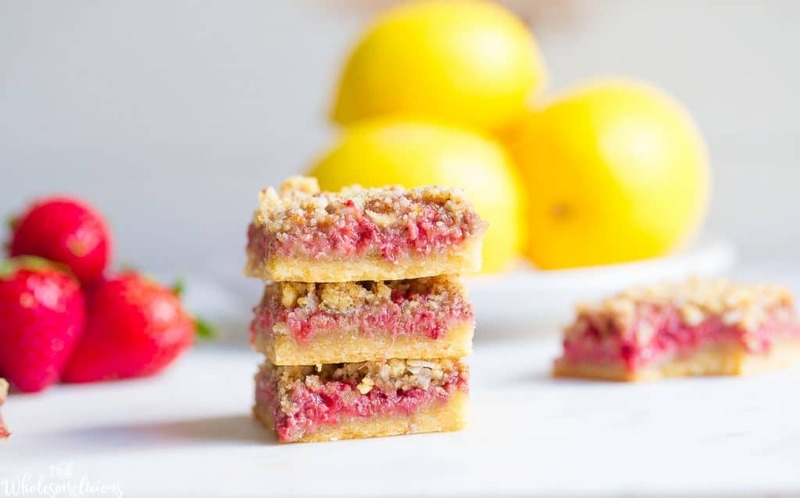 Strawberry Lemon Bars have three delicious layers! A shortbread crust, strawberry lemon jam, and a crumb topping are sure to please anyone. 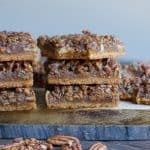 These yummy bars are irresistible and no one will ever guess they are grain-free, Paleo, and Vegan! If ever there were a perfect pairing for dessert (besides my beloved chocolate + coffee flavor), it would most definitely be strawberries and lemon. 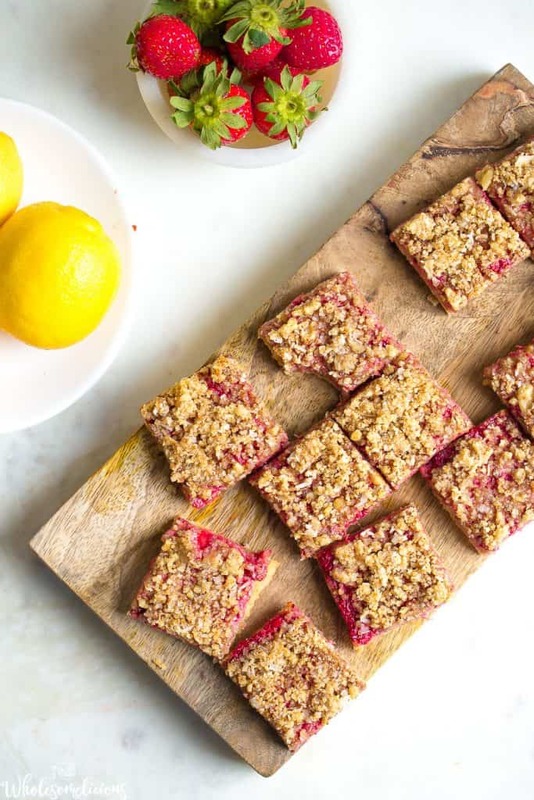 These light, fruity, and delicious bars are just what you need to get in the spring time mood. 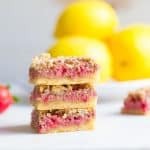 Bursting with subtle hints of lemon and a homemade and super easy flavorful strawberry jam, these bars also have a delicious texture of a crumb topping. True statement: I never make desserts with lemon. I love lemon in savory dishes, and with a glass of water in the morning, but with dessert? Nah, I’ll stick with chocolate. I have kind of deprived my family of any lemon desserts, and they know it. It’s usually the first thing they order for dessert if we’re out somewhere, or the first dessert they will snag at a social gathering. So when my daughter asked me if I had any lemon desserts she could try baking, I had to think about it for about 2 seconds before replying, “nope”. She told me we needed to fix that, and all other members of the family agreed. 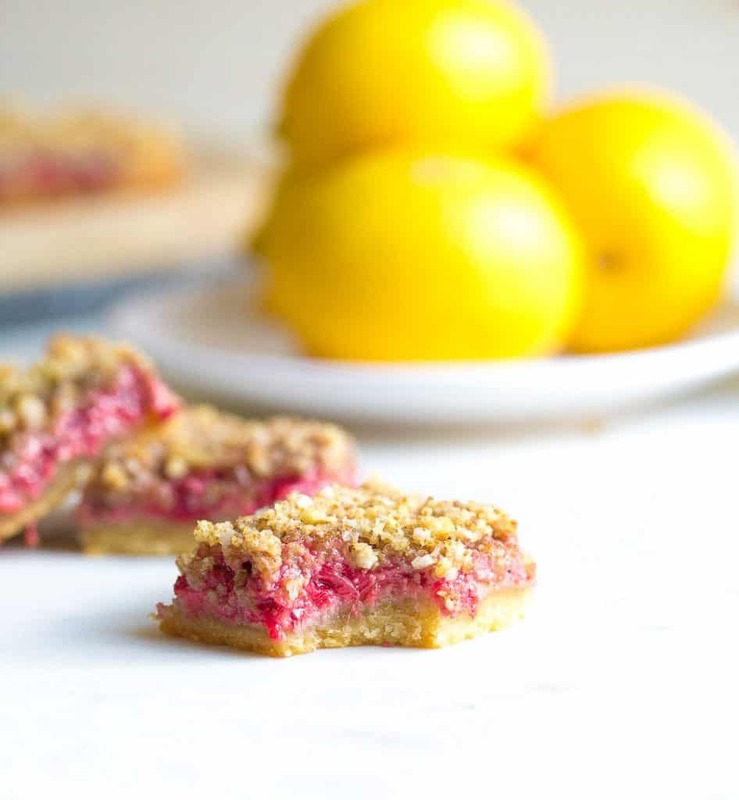 We set to work making these Strawberry Lemon Bars with a crumb topping. 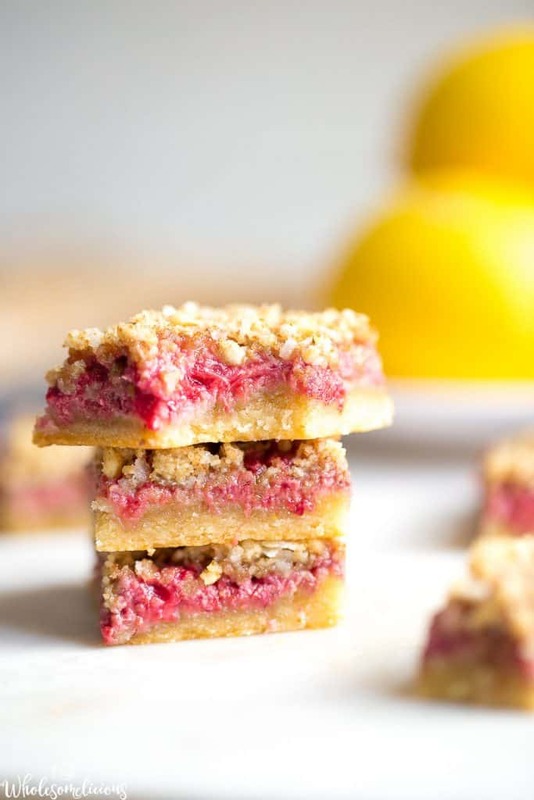 They are similar to my Raspberry Crumb bars, but have lemon infused into the shortbread, and into the jam. We all loved the way these came out! Even this chocoholic enjoyed a few of these bars and didn’t even miss the chocolate. 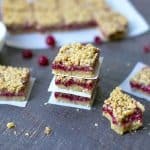 Something about the spring time gets me excited for berry season, and these bars are the perfect spring time treat! Begin by making your filling, this has a jam consistency. In a medium saucepan, combine strawberries, lemon juice, maple syrup and lemon zest. Heat to a medium to medium high heat, until mixture begins to bubble. Let bubble for 1-2 minutes, then lower heat to a simmer. While simmering, be sure to mash the berries with a wooden spoon. Cook for an additional 2-3 minutes, remove from heat. Add in chia seeds. Let cool for 5-10 minutes before transferring to a glass jar or dish, and place in the fridge to cool completely. This will take about 1 hour, but you can also make the filling and let sit overnight. Preheat your oven to 350 degrees. To make your crust, combine all crust ingredients into a food processor. Pulse until a dough like texture forms. Press the crust into an 8x8 pan, evenly distributing. Place in the oven and bake for 15 mins. Set aside and cool. Leave oven on. Once crust is cooled, spread the jam filling over the crust. Complete by topping with the crumb mixture. Now bake for 20-22 minutes, or until top is golden brown. Remove from oven and cool completely. Once cooled, cut into squares. I’ve been saving a crazy amount of lemon dessert recipes lately and these are #1 on my list to make. They look sooo good! Hope you love them Hayley!! What is the oven temp? Thanks! 350!! I’ll change that now, thanks! What if I can’t find lemon extract? You can use almond or vanilla. I just made these for the second time for a friend’s birthday, and she loved them! The first time I made them when family was in town. I served them for dessert after eating your citrus and thyme grilled chicken. All sooo good! 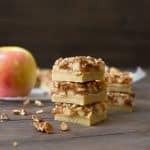 A friend and I love your blog and we always share your recipes with each other after we make them. Thank you for being yummy, healthy, easy, and delicious! 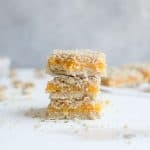 Should the coconut oil for the crumble be solid or liquid? Maybe it doesn’t matter? Can’t wait to try these! I love a desert that doesn’t have tons and tons of sugar/honey/mapleSyrup!